Daniela Neeff - "Love It!" 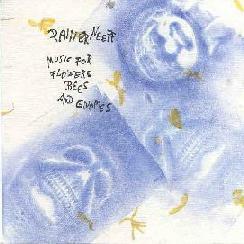 / Rainer Neeff - "Music For Flowers Bees And Gnomes"
Two new solo releases from members of the German surf/psych trio The Pancakes, whose two full lengths were reviewed a few issues back (see AI #19). First up in the CD player is “Love It” by Pancakes bassist/vocalist Daniela Neeff. The opener, “Set Me Free”, pretty much sets the tone for most of this release: upbeat 60s style folk/pop/rock. There is some extra instrumentation and post-production work, such as the tasty backwards guitar solo in “Set Me Free” that sets a few of the songs apart from contemporary mainstream rock, and others (“Social Club”, “Sunshine Breath”) that could be Sheryl Crow songs for all I know. This may appeal to a lot of people, but I am guessing that your average AI readers are not among them. The closer, “Keep Us Together” is a bit more country folk and melancholy and reminds me a bit of the 80’s group Opal, and is my personal favorite on here. Overall, “Love It!” has some nice moments, but much of it is just a little too straight ahead for me, I guess these days I just connect with things that are a little more screwed up. Which brings us to the newest installment by Pancakes guitarist Rainer Neeff, whose Frisco Howling LP I raved about a few issues back (see AI #19). While there is nothing as singularly monumental as the title track from that LP, this new collection of 21 tracks of living room recordings has all of the great screwed up charm and weirdness that made the LP one of my favorite outta nowhere releases of recent memory. Opening with the delicate acoustic instrumental “Dawn Byrds” through west coast psych styled instrumentals “Bees in Different Colors” and “Dune Surf” through twisted psych weirdness (pretty much everything else), I once again flashed on the brilliance of Brother JT’s solo work, and even Kim Fowley and some of his twisted projects such as St John Green. This doesn’t really sound like either of 'em too much, but the has that similarly crazy/individualistic feel. Yeah, it’s just a CD-R of some home recordings, but sometimes that is where the best stuff comes from. Once again, check him out. Both CD's are distributed by Swamp Room Records. You can visit their web site at: http://www.swamp-room.de. Contact via snail mail c/o Swamp Room Records; Kucharzik & Mittendorf GbR; Postfach 5663; 30056 Hannover; Germany.